Recently, more people have been asking how to “join” CID. As there is no membership fee, this turns into a question about how to join the CID community. More details are provided on the What We Do page, but here’s a brief summary. To start, learn about the group; read About CID, Who we are, What we do, skim through the CID mission, history, and/or read our brochure, FAQ, or Wikipedia entry. Then, see how it can be useful to you, and you to the group. Look over the publications to see if you want to use some of what’s here, or notice a gap where you can contribute something new. If you’re fluent in a language other than English, and want to translate any of the concepts, case studies, or posters, or if you’re able to review translations by others, send an email. Once you contribute something, you have earned a researcher profile on the site, which helps others find out about you. If you’re a student (up to and including doctoral level), submit a video to the CID Video Competition (deadline: May 31, 2018). If you’re faculty, tell your students about the competition. If this looks like a helpful organization for you, sign up through WordPress directly (either through your own WP site if you have one, or through email – top right of page on a computer screen, bottom on a smart phone) or subscribe using any of the social media platforms: Facebook, LinkedIn, Twitter, or YouTube. Any of these adds you to the list of people notified when a new post appears; none of them adds you to a listserve (there isn’t one). None of your information is shared with any other organization. From October 2016 until March 2017, Min He conducted research to learn about the social media subscribers of the Center for Intercultural Dialogue. As CID aims to establish connections between scholars in the field of intercultural communication, the large follower base is of central importance for both the Center and those connected to it. The study is primarily based on those subscribers for whom enough details could be obtained, amounting to 967 individuals out of the total of 2802 followers CID had across all social media platforms on January 11, 2017 when data collection stopped and analysis began. LinkedIn, Facebook and Twitter were the three major resources for data collection, as they provide the greatest amount of detail about subscribers, either individually (LinkedIn) or as a group (Facebook and Twitter). The results of the study show that CID has social media subscribers across the globe. The largest single group is based in the USA, but the majority of followers are based in other countries, as the charts below illustrate. The data represent the 967 followers’ countries of residence: in many cases their respective countries of origin are different. As CID especially aims at serving scholars, it is not surprising that most followers in the subset have substantial education: almost three quarters have completed a master’s degree, and almost 40% a Ph.D.
Not surprisingly, the majority of the followers in the subset are based within academia (58%), with most of the rest being professionals of various sorts (37%). For either group, most persons are active in the discipline of Communication. The following charts show the exact distribution. Within Communication, the single largest specialization is Intercultural Communication, for obvious reasons. In conclusion, the study shows that the followers of CID form a large and varied group of persons engaged with intercultural dialogue on different levels. As the CID embraces diversity and integrates multicultural members drawn from around the world into a single network, it builds a borderless online community for scholars and professionals alike. To that end, the CID LinkedIn group has proven particularly appropriate for helping to establish connections. As a result of the efforts of Min He over the past 6 months to learn about the followers of the Center for Intercultural Dialogue on various social media, it has become obvious that there is very little activity on either Google+ or Pinterest, with only a few dozen followers on each site (compared to the hundreds on LinkedIn and Twitter, and over a thousand who are currently members of the CID Facebook group). The CID accounts on both of these platforms will therefore be terminated as of April 15, 2017. Please subscribe to CID on any of the other social media platforms: Facebook, LinkedIn, Twitter, or YouTube, either by clicking on these links, or the logos on the right side of the page. If you have any difficulties and want to talk to a person, just email me directly. My apologies for the time these changes will require. The Center for Intercultural Dialogue is changing the basic website template as of today. The goal is to adopt a responsive theme so that the increasing number of followers who access the site on mobile devices will be able to locate content and move around the menu. Hopefully it will be an easy transition for all. Advance apologies for any glitches that occur during the transition; they will be repaired as quickly as possible. One note: to access the category cloud that used to show on the bottom left of the home page, you now need to click on any post and it will show at the bottom of the page again. You are welcome to send comments about this, as about all other matters. CID has passed 2000 subscribers! Thanks to all of you who have subscribed to the Center for Intercultural Dialogue’s website, we have crossed the 2000 mark! This number includes those who have followed through WordPress (available only to those with their own WP sites), those who have signed up for email notifications, as well as those who follow through Facebook, Twitter, or Google+. WordPress cannot directly track those who have joined the CID LinkedIn group (currently at 274 members), or who follow on YouTube or Pinterest, so the actual number of subscribers in fact now totals 2349! It took 3 1/2 years to reach 1000, but only another 2 years to pass 2000. Likes on Facebook, retweets on Twitter, and sharing of posts all expand our reach, and are much appreciated. Researcher profiles and the CID publication series Key Concepts in Intercultural Dialogue receive considerable numbers of views, as do guest posts (which you can access through the word cloud at the bottom left of any page). Even the Wikipedia article on CID is read half a dozen times each day. As the number of followers has increased, email sent to CID has increased as well. The largest single number of viewers are from the US, but it is people outside the US who most often write in with requests of various sorts. As an example, the past week brought emails from Colombia, Switzerland, Nigeria, Greece, and New Zealand; the week before that from Ghana, Hong Kong, Malta, Belgium and Serbia. I try to answer all emails within a few days, and to post relevant information that is submitted about conferences, publication opportunities, fellowships, grants, post-docs, etc. within a week, though occasionally there is a longer line. Author Center for Intercultural DialoguePosted on June 13, 2016 June 3, 2017 Categories About CIDTags Center for Intercultural Dialogue, social media, Wendy Leeds-HurwitzLeave a comment on CID has passed 2000 subscribers! CID is 5 years old! This WordPress site was established in 2010, with other social media following in 2011 (Facebook), 2013 (Twitter, LinkedIn, YouTube, Google+, Pinterest), and 2014 (a Wikipedia article). Nearly 2000 people now follow CID across one or more of these fora, and requests now arrive every few days to post information to this community. Thanks to all those who have made this project possible, to all those who have connected with CID in some fashion, and to all those who have contributed to CID in any way. Author Center for Intercultural DialoguePosted on March 31, 2015 June 3, 2017 Categories About CIDTags Center for Intercultural Dialogue4 Comments on CID is 5 years old! If you’ve stayed in Airbnb yourself and want to join the conversation, add a comment below. Thanks to all of you who have subscribed to the Center for Intercultural Dialogue‘s website, we have just crossed the 1000 mark! This number includes those who have signed up through WordPress for email notification each time a new post appears, as well as those who follow us through Facebook, Twitter, or Google +. WordPress cannot track those who have joined the CID LinkedIn group (which currently stands at 112), or who find CID through YouTube or Pinterest, so the actual number of subscribers is actually even higher. It took 3 1/2 years to get to this point, but presumably it will take a lot less time to get to 2000! As the number of followers has increased, CID’s email has increased as well. We try to answer all emails within a few days, and to post relevant information within a week. 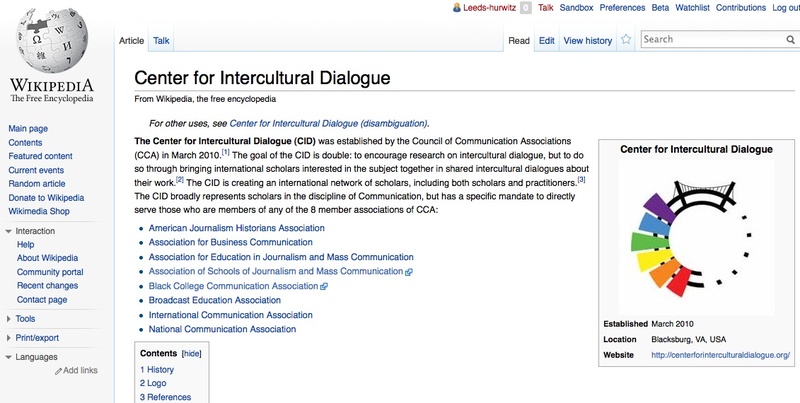 Author Center for Intercultural DialoguePosted on February 22, 2014 February 22, 2014 Categories About CIDTags Center for Intercultural Dialogue, social media, Wendy Leeds-HurwitzLeave a comment on CID has 1000 subscribers! In case there has been any doubt, the Center for Intercultural Dialogue definitely exists – and we know this because now there is a Wikipedia entry saying so! This was created as one response to the National Communication Association call for increased entries on communication-related topics by communication specialists. (Details may be found on the NCA Wikipedia Initiative page.) For those who have not yet created an article on Wikipedia, the official standards are quite stringent about what is sufficiently “notable” to merit an article. (Of course, that doesn’t mean all articles currently posted meet those standards.) And there is an elaborate formal system to learn in order to participate in the site. But in today’s world, there is a sense in which any serious endeavor should be represented there, so it seemed worthwhile creating an article. Minh Cao gets credit for taking the time to first learn the guidelines, and post the first draft. For those who have not yet created articles, a warning: this took 3 drafts over 2 months, and help from 4 different editors at Wikipedia, before approval was granted for a substantially shorter article than originally envisioned. Apparently such delay and critique are common. In addition to the Facebook organizational page developed several years ago, the Center for Intercultural Dialogue now has a social media presence that includes LinkedIn, Twitter, Pinterest, YouTube, and Google Plus. Nearly all of this activity is due to the efforts of Minh Cao, Assistant to the Director. Substantial thanks are due to Minh for making the CID accessible across multiple platforms in 2013. The goal for 2014 will be to determine what content best fits each of these contexts, and to expand the impact of the CID as a result.